Best known for his efforts to defeat anti-piracy protection Denuvo, the cracker known as 'Voksi' has revealed another string to his bow. 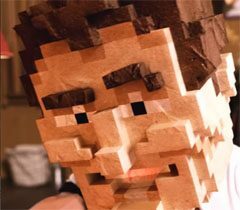 After participating in the closed beta of Serious Sam's Bogus Detour in 2016, he got friendly with the game's developers. Now, with their permission, he's giving the game away for free in an effort to boost sales of the action adventure. Bulgarian cracker Voksi is unlike many others in his line of work. He makes himself relatively available online, interacting with fans and revealing surprising things about his past. Only last month he told TF that he is entirely self-taught and had been cracking games since he was 15-years-old, just six years ago. Voksi is probably best known for his hatred of anti-piracy technology Denuvo and to this day is still one of just four groups/people who have managed to crack v4 of the anti-tamper technology. As such, he and his kind are often painted as enemies of the gaming industry but that doesn’t represent the full picture. In discussion with TF over the weekend, Voksi told us that he’s a huge fan of the Serious Sam franchise so when he found out about the latest title – Serious Sam’s Bogus Detour (SSBD) – he wanted to play it – badly. That led to a remarkable series of events. “One month before the game’s official release I got into the closed beta, thanks to a friend of mine, who invited me in. I introduced myself to the developers [Crackshell]. I told them what I do for a living, but also assured them that I didn’t have any malicious intents towards the game. They were very cool about it, even surprisingly cool,” Voksi informs TF. The game eventually hit the market (without Voksi targeting it, of course) with some interesting additions. 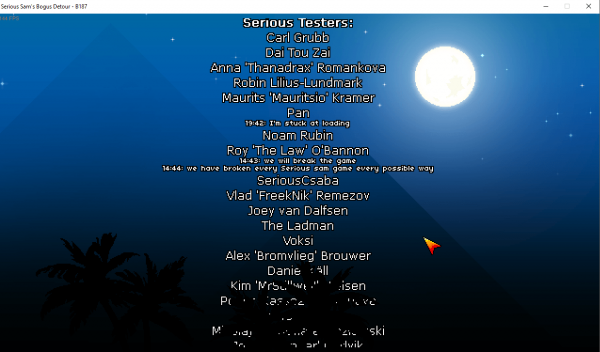 As shown in the screenshot taken from the game and embedded below, Voksi was listed as a tester for the game. An unusual addition to the game credits…. Perhaps even more impressively, official Stream screenshots here show Voksi as a player in the game. It’s not exactly what one might expect for someone in his position but from there, the excitement began to fade. Despite a 9/10 rating on Steam, the books didn’t balance. “The game was released officially on 20 of June, 2017. Months passed. We all hoped it’d be a success, but sadly that was not the case,” Voksi explains. Voksi was really disappointed that things hadn’t gone to plan so he contacted the developers with an idea – why didn’t he get involved to try and drum up some support from an entirely unconventional angle? How about giving a special edition of the game away for free while calling on ‘pirates’ to chip in with whatever they could afford? 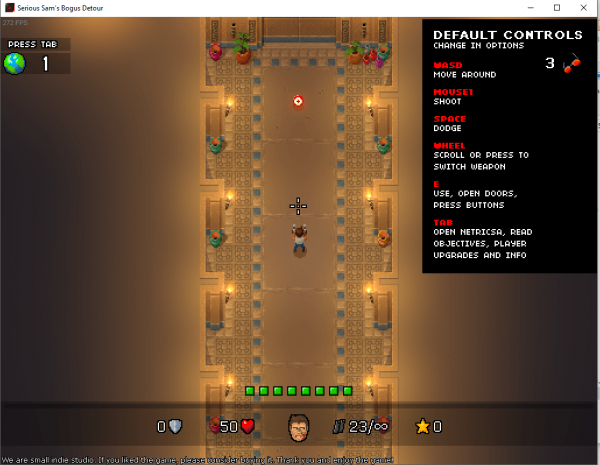 “Last week I contacted the main dev of SSBD over Steam and proposed what I can do to help boost the game. He immediately agreed,” Voksi says. But Voksi’s marketing plan didn’t stop there. This special build of the game is also tied to a unique giveaway challenge with several prizes. It’s underway on Voksi’s REVOLT forum and is intended to encourage more people to play the game and share the word among family, friends and whoever else can support the developers. Importantly, Voski isn’t getting paid to do any of this, he just wants to help the developers and support a game he feels deserves a lot more attention. For those interested in taking it for a spin, the download links are available here in the official thread. The ‘pirate’ build – Serious.Sam.Bogus.Detour.B126.RIP-Voksi – is slightly less polished than those available officially but it’s hoped that people will offer their support on Steam and GOG if they like the game.